We produce a number of different Salamander grills across two different ranges in both natural and propane gas variants. Whatever your particular use case may be, we've got a Salamander grill that'll be perfectly suited to your business needs. The Silverlink 600 series features a selection of compact yet powerful salamanders. 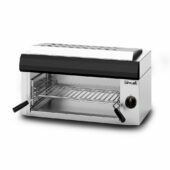 The GR3 comes with a toasting grid and crumb tray, while it's also capable of producing perfectly grilled meat and fish. This model is ideal for any modestly sized, fast paced restaurant, pub or takeaway. The more powerful GR7 comes with a branding plate that'll perfectly create those much sought after branding marks. It's ideal for burgers and steaks, but will also do toast with ease. The GR7 is perfectly suited for any busy restaurant, pub or takeaway. 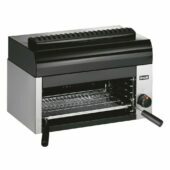 As with all the products across this series the Silverlink salamander grills are also 600mm wide. The Opus 800 series of salamander grills features three independently controlled heat zones for maximum versatility. Each separately controlled heat zone gives you the option of operating each zone independently as a small cooking area during quieter periods, and each zones can also be used to work in unison to help cope with busier periods. The rapid heat up time of each grill saves on waiting time and also reduces overall running costs.